Thread: Tom Brady - Greatest Ever? I had a mini debate with my Dad today. I talked of how one would rate a QB "best ever", and whether SB win alone should dictate it? In other words, where does Dan Marino stand in the rankings? For that fact, where do ANY of the better QB's, that never got to play in the big game due to playing on mediocre teams/owners and such? But then we got into length of play. It's getting longer now, thanks to the protection to all the QB's and barely being allowed to be touched. I actually nitpicked down to every last imaginable comparison that you can use when comparing QB's. This was about a 90 minute discussion and I can talk fast! 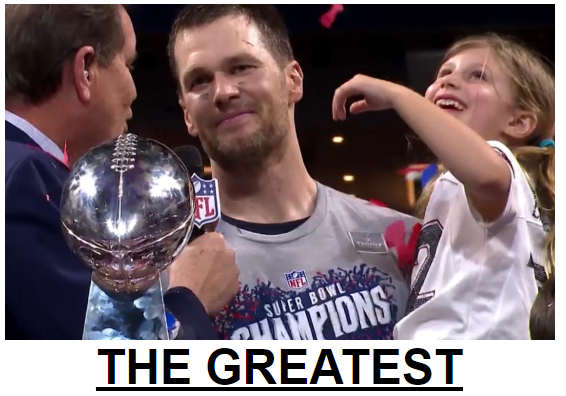 So I covered like 300 or so different reasons, and I didn't plan it that way - but I think I was looking for reasons, any reason - to diminish what Tom Brady has accomplished. Then I see folks as great as Gronkowski, and see that he has only won 2 of those SB's. Longevity. Brady has all 6 rings. I don't want to say it, but no one can argue, I think, with a straight face - and state he isn't in fact the best QB ever, at the very very least of the SB era of the past 53 years... at minimum. Depends on whether he cheated. I like Drew Brees. And Montana. I like Terry Bradshaw, and he has 4 SB wins as well. But he was nowhere near the numbers that Brady has, nor the accuracy & completion percentage. I think he had a stronger arm though! But wasn't as accurate. And they didn't pass as much back in those days. But the 2 visually side by side, and I just don't see him comparing, nor many others. It is so very hard to compare one era to the next. Championships and longevity always seem to be the arguing chips in these comparisons. was not too shabby, either but still in a run-based league. So to me, barstool comparisons are almost invalid. Last edited by Elessar; 02-04-2019 at 08:26 PM. In ANY era - to make it to 9 championship games - and to win 6 titles - that's a helluva accomplishment! Not nearly matched in the modern era, and not much to match it up to from the old days either. But there is no true way to know, as there were SO many greats. Other than football do we really ever hear about Brady? No. No drugs, no domestic violence, and no smack talk. Remember the group "Bachman Turner Overdrive"? ....One of their biggest hits was "Taking Care Of Business"..... nuff said. Hey Tom, hope you and your family have a great time at DISNEYLAND!!! RAMS GOT SAYONARED!